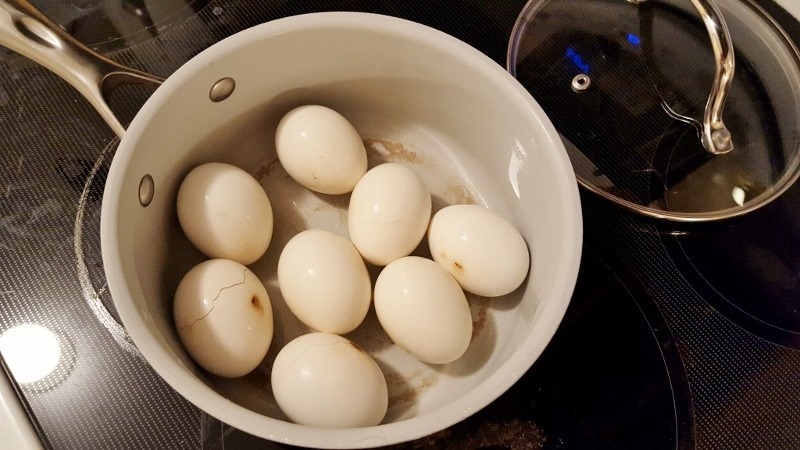 But first let’s talk about kitchen safety because I managed to somehow burn off all the water while cooking hard-boiled eggs and completely fried the pan! I thought I was going to be super organized and healthy and prep a bunch of eggs for the week. The eggs were on sale too so I had two 18 packs of them! I love eggs so I figured scrambled for breakfast, hard-boiled for snacks and lunch and I’d be all set! Well, I had good intentions. No matter how many times I make hard-boiled eggs I always double check how long to keep them in the water. I found directions for the perfect hard-boiled egg = rolling boil, remove from heat, let sit for 12 minutes, rinse with cold water. My first batch came out perfect. But when I put the second batch on to boil I walked away and got distracted by TV and email. Then, I hear some weird “pop!” noises coming from the kitchen? That’s weird. Maybe the neighbors are making popcorn? It was the eggs! All the water had burned off and they were popping and dancing around on the heat!!! There are small burn marks on all the eggs but they’re actually still edible. Not ideal, but edible. I’m not a complete fail in the kitchen though. When I went to get ingredients for scones the other night I grabbed this pack of marzipan for Ben. He’s obsessed with the stuff! Because my baking quota was maxed out for the week I took a short cut and used a can of refrigerated cinnamon rolls. 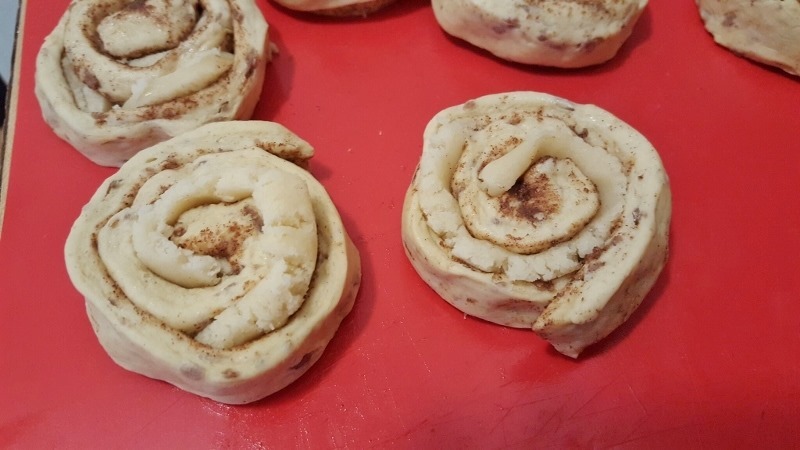 I just squished the marzipan into lines, unrolled the cinnamon rolls and then rolled them back up with the paste the middle. Boom!The chocolate chips on top were totally unnecessary but I had them leftover from the scones. Ben thought these were AMAZING! He loved them!! 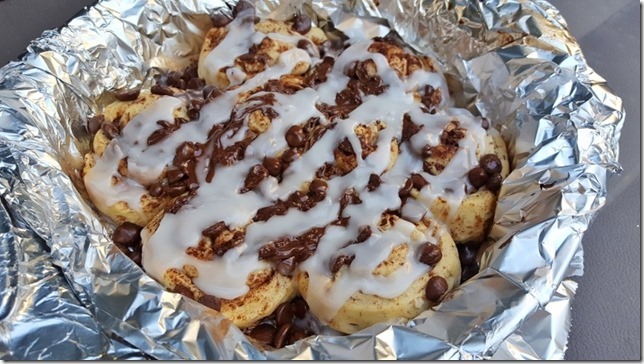 I’m really happy he loved them but… I’ve made the Pioneer Woman cinnamon rolls in the past. 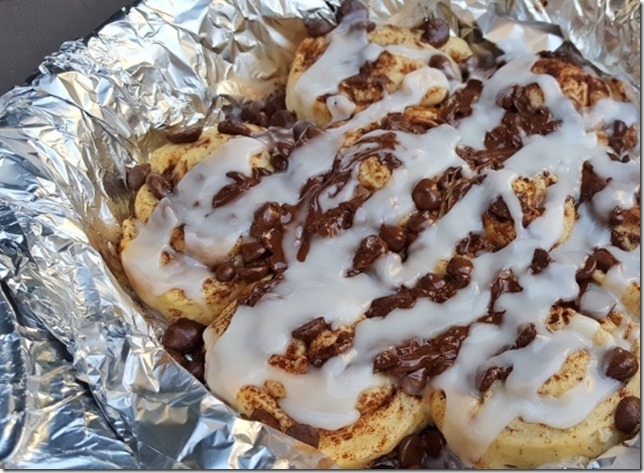 I feel like his reaction to these was just as enthusiastic as when he tried the 28 step Pioneer Women recipe (which took several hours to make and created in epic mess and the kitchen). 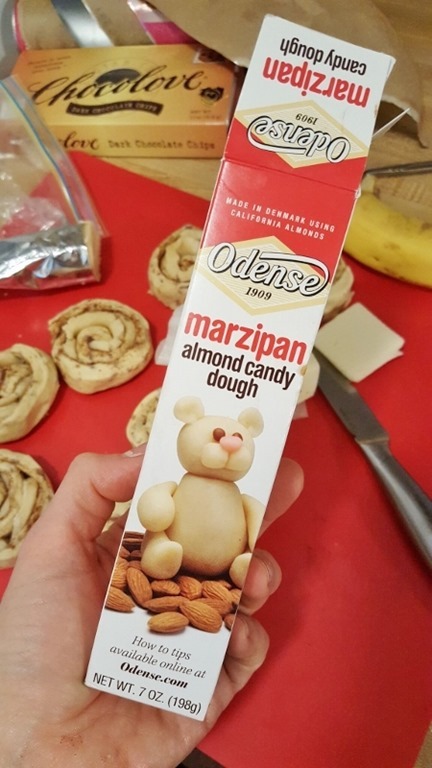 The just shows me that his taste buds don’t work and I shouldn’t kill myself trying to impress him in the kitchen or he really loves marzipan that much. Hmmmm. Day 2 of Running Safety Week! Did you check your route on day 1? Did you think of a way to make it safer? We’ve been taught this since we were kids – use the buddy system. 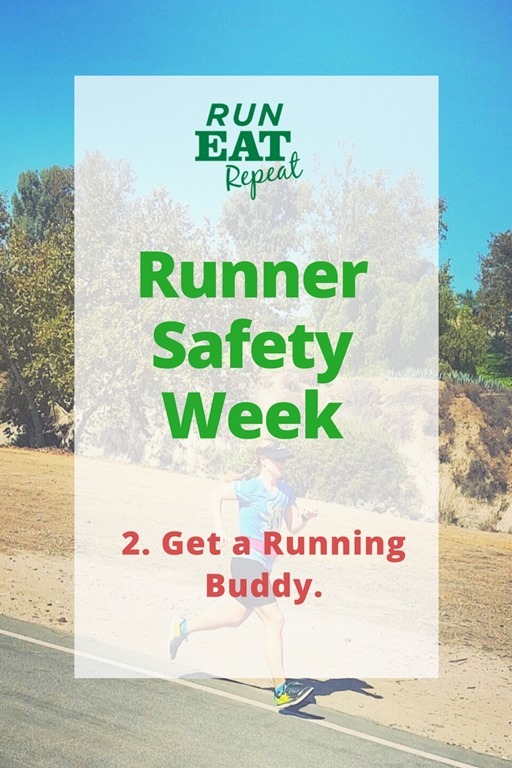 Running with a buddy is safer than running alone. But I will be the first to admit I like running alone. That’s okay. It doesn’t make me a bad person, I just like running to be my lil solo time. Yeah, there’s nothing wrong with that but it’s not the safest choice. 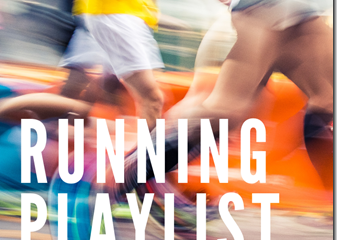 So let’s talk about a few options for getting a running buddy. 1. Actually get a running buddy. Find a friend or acquaintance that’s training for the same race as you OR who runs around the same time and place. Take turns meeting at their house and then yours. It’s not always convenient, but it’s safer and keeps you accountable. 2. Run at the same time and place as your buddy BUT not with them. Find someone who runs around the same place as you and agree on a time and place to start running. Once you are there you both can do your own thing – you don’t have to run side by side or together at all. But having someone else on the same route as you – even if they are a little ways in front or behind – means the path is more populated. This works if you know a runner who runs a lot faster or slower than you. 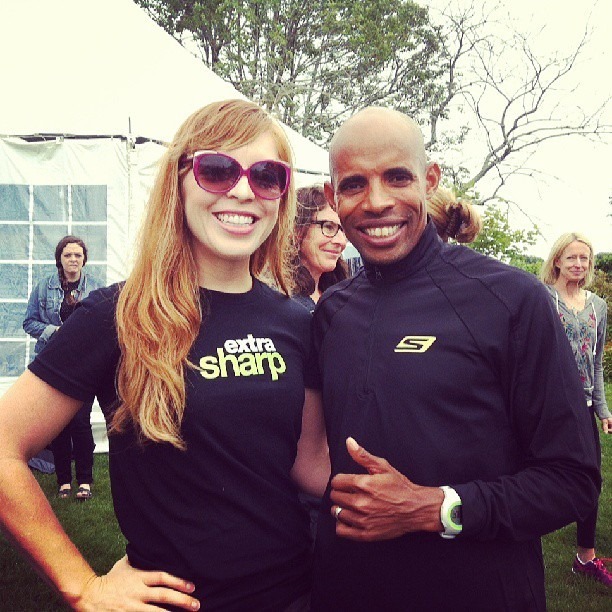 Meet up to start and finish your runs but don’t feel pressured to run together. Do your own thing, but keep an eye on each others as much as you can and be sure to communicate if you see anything weird. Other option: Get a friend, spouse, parent, sibling, frenemy… to bike ride on the path when you run. They will be going a lot faster on a bike but can go out and back a few times to say hi, hand you water or Skittles and check-in with you. I found my running buddy… he just doesn’t know it yet. 3. Run with or at the same time as a local running group. I take afternoon walks and see the Snails Pace running store group running once or twice a week. If I was an afternoon runner I could time up my runs to be on that path where I know other runners will be. 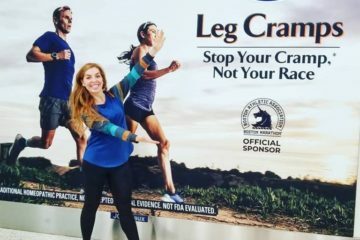 Look up local running groups and join them! Local running stores often have running group info or check meet-up.com. If you don’t want to join them – just find out when they are running and run at the same time in the same place. Basically I’m saying you should be the creeper following around a group of runners… out creep the creepers by being even creepier! Boom. Do you have a running buddy? Is there someone who might want to run with you? 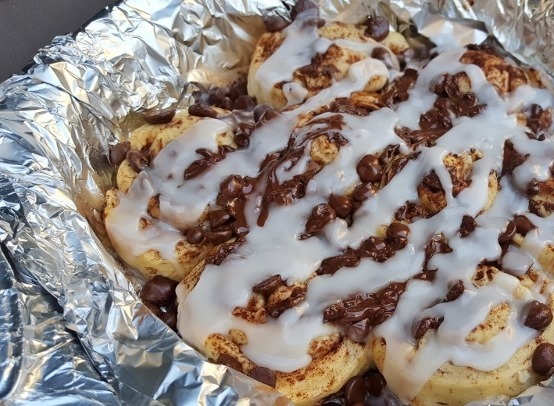 Those cinnamon buns look so delicious! I think I might start running with my basset hound. She’s about my speed at the moment. I usually run on my treadmill since I like to run before work (and 4am is always dark), but my treadmill seems to have hit a rough patch, so I’m hoping we can both get used to running in the dark. I just started running, like literally just did my first three miles the other night. So I am neither predictable nor do I have a partner. But when I go out on a bike ride, I do try to go with a buddy. 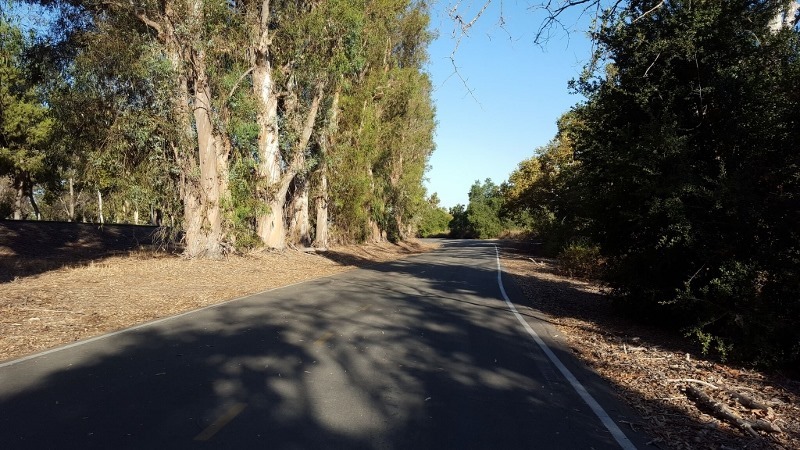 I’m less concerned about being attacked on a bike ride and more concerned about running into a problem with traffic, a flat tire, an unexpected fall. Good stuff here, Monica. I’ll definitely keep this in mind the next time I go out for a run. I just discovered running with my boyfriend’s 85 lb dog. He’s a great running buddy except that he has to stop and sniff a ton. I try and do my long runs with friends. It’s always hard to coordinate.